A dramatic heat burst struck Oklahoma City, Oklahoma overnight with a sudden increase in temperature and severe winds that spread damage across the city. A heat burst is a very rare event that occurs only occasionally as a thunderstorm decays.Â When thunderstorms are growing, they draw warm, moist air up and into the cloud where moisture condenses and falls out on the other side.Â But when a thunderstorm surpasses maturity and a lot of moist air is held high in the cloud, it begins to drop as the thunderstorm loses its updraft.Â As this heavy, rain-cooled air begins to fall, it compresses due to higher pressure at the surface.Â As the air compresses, it heats up (think of pumping air into a tire and the tire heats up).Â This heating can be substantial and is reflected in surface temperature readings when a heat burst impacts the ground. The evolution of a heat burst begins with a mature thunderstorm (left). As the thunderstorm matures, the upward movement of warm, moist air begins to cease and the downdraft begins to accellerate. 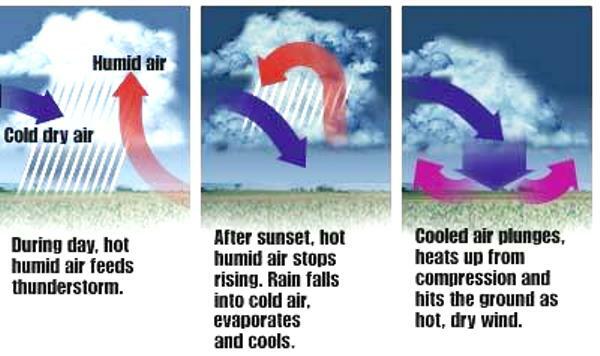 As the thunderstorm loses upward momentum, the downward movement of moist air causes compression and heating, resulting in damaging winds at the surface. 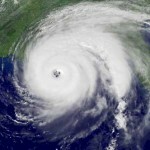 The other headline result of a heat burst is the strong wind.Â As the air plummets from beneath the thunderstorm and hits the ground, it has no where to go except outward.Â In much of the same dynamic principle as a thunderstorm microburst, the air crashes into the ground and spreads out in all directions, frequently reaching winds that exceed hurricane strength. Since heat bursts are closely associated with decaying thunderstorms.Â Thunderstorms are fed by warm, moist air that rises in response to solar heating.Â When the sun sets and the surface heating ceases, many thunderstorms lose their primary energy source.Â Once this source is absent, many thunderstorms begin to decay.Â Since heat bursts are closely related to this decay process, it follows that most heat bursts occur at nighttime. The recent heat burst in Oklahoma City occurred at 1am on May 13th.Â The temperature soared to over 90 degrees as wind speeds topped 55 mph.Â Damage was widespread with small trees and limbs reported down throughout the city. Dramatic heat bursts have occurred throughout the plains states.Â Kearney, Nebraska was impacted by a heat burst in on June 20, 2006 when the temperature went from 70 to 93 in minutes overnight and wind speeds topped 60 miles per hour. More recently, on August 3rd, 2008, a heat burst in Sioux Falls, SD forced air downward in such a dramatic fasion that the wind speeds over 50 miles per hour and the temperature jumped from 70 to 101 in less than 20 minutes. I question your reasoning for “heat bursts” and challenge you to present atmospheric soundings for each case stated. Your hypothesis is not fundamentally sound. A more realistic explanation involves an inversion whereby a downdraft advected hot temperatures down to the surface. I would appreciate seeing the basis for your reasoning. Heat burst in Oklahoma city, I think we must become take care in our environment.